The house, which sits in its own 2.5 acre wooded grounds, has 6-8 bedrooms, 3 bathrooms and 2 shower rooms, as well as a Grand Salon of 80 sq.m., a large formal dining room, a smaller private dining room, a library, a study/office, a gym, laundry room, wine cellar, and an integral garage for up to 6 cars! 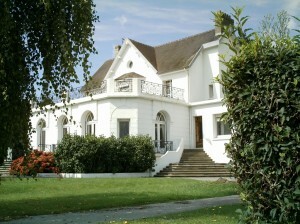 The former staff apartment, in part of the west wing of the White House, is currently being used as an independent one-bedroom holiday apartment, to provide the present owners with an annual income of over 10,000 euros, but these rooms could be used equally well as a granny flat, self contained student accommodation, or even as professional office/consulting room space. Only ten minutes from the fabulous beaches at Berck and Fort Mahon, the White House is also conveniently situated for travel to London, Paris and Brussels . It can be reached by car in less than one hour from the Channel Tunnel, and less than two hours from Paris Charles De Gaulle airport.